Goa, is the smallest Indian state with a territory of 3,702 sq km. It is located in the Western Ghats. A tropical paradise, it is bathed by the warm waters of the Arabian Sea. 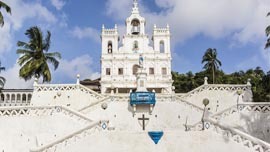 The culture of Goa is a blend of Indian and Iberian: European style central squares and Indian bazaars, Portuguese churches sharing their walls with Hindu temples.Goa is best known for its spectacular beaches and luxurious hotels but there are many old churches, monuments, temples and museums which are worth visting. In terms of tourist destinations, Goa figures among some of the most popular holiday spots. Besides being a location for some of the most beautiful beaches, it is also one of the biggest Christian pilgrimage sites in Asia. With close proximity to the Western Ghat range, Goa is also blessed with rich flora and fauna making a biodiversity hotspot. 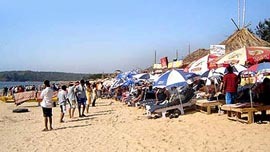 Its presence in the tropical zone and closeness to the Arabian Sea lends a warm and humid climate to the state of Goa. It's an ideal holiday and religious destination for travelers from across the world. Panaji is the capital city of the state of Goa and is the third largest city in the state. The city is one of the tourist destinations in the country for all types of tourists from various parts of the world. 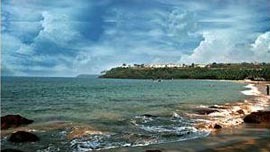 Also known as Panjim, Panaji is located on the banks of the Mandovi estuary and the Arabian Sea. It is an important part of the North Goa district. According to the local dialect, Panaji is popularly known as 'the land that does not flood'. The ideal time for tourists to come for Panaji travel is between the months of October and February when the weather is fine. The weather is these months are pleasant with very little rainfall. The climate in Panaji is mostly marine tropical. The summer months are hot and humid while the winter months are pleasant and dry. As the city is located close to the sea, cool breeze blows over it almost all over the year. It Has a length of 11 Km. from Panaji. It has important religious and educational centre of Christian Missionaries. 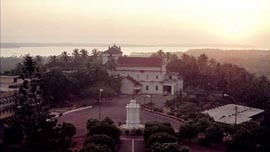 The Church, Seminary and School atop hillock command a magnificent panorama of the country side around and provide fine view of Mormugao Harbour & Zuari river. To the right of the front of the church is the chapel containing the tomb of Father Agnelo, the object of Pilgrimage for thousand of people each year. Beyond this is a shaded courtyard, cloistered and galleried, with frescos that give an excuse to linger, if excuse is needed in this haven of peace for while the monastery is secluded, high above the busy world below and not casually accessible. Mapusa, also pronounced as Mapsa by the locals, this place is situated on the converging point of the National highways going through Goa. 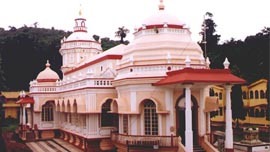 Mapusa has only a limited number of hotels and accommodation because it is a mainly commercial town catering to the locals and has a large resident population. Mapusa's nearness to many famous beaches of the north makes it an appropriate tourist spot during the peak tourist season in the months of October to March. Margao was famous for its fish market, which used to be an amusing and entertaining sight. Lots of fisher women used to assemble at a market place in south Goa near the Municipal Office building and sell their catch by publicizing it in the top of their voices. Their clothes were one to watch out for. The colors were very brilliant and used to add to the beauty of the women. Most people visit Ponda en route to the wildlife reserves or the nearby Hindu temples. There is nothing of interest in the town itself. 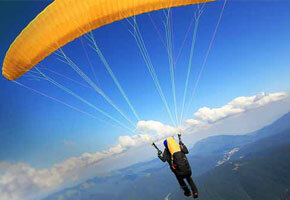 It is located 28km southeast of Panaji and 17km northeast of Margao. Ponda was one of the first places to be conquered by the Portuguese, but was immediately retaken by the Adil Shah kingdom of Bijapur. It was ceded by the King of Sunda in 1791, and thus became part of Goa. The Safa Masjid, 2km west on the road to Panaji, is the best-preserved 16th century Muslim monument in Goa. This small mosque was built by the Bijapur ruler Ibrahim Adil Shah in 1560. It is one of two Muslim shrines not destroyed during the Portuguese Inquisition. 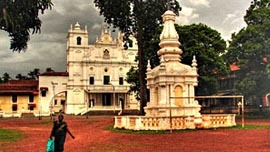 Vasco da Gama is the biggest town of Goa. Majority of Goa's population resides over here. The layout of the city of Vasco da Gama is well planned and is very clean. The architecture is aesthetically pleasing and it has some very old structures existing with modern buildings. Vasco da Gama is the commercial hub of Goa and many important economic activities take place here. The town is industrialized and has an important seaport. The Mormugoa Harbor is a very important commercial center and is the core from which ship vessels are sent off to other countries, which trade in minerals such as iron ore and spices. It is a natural harbor which docks ships from almost all over the world.